Omega-3 essential fatty acids can be found in fish oils, and in certain plants and nuts. However, the greatest source of Omega-3 is fish oils, specifically deep-sea fish. Fish oils provide an abundant supply of healthy fatty acids that the body cannot manufacture for itself. The body needs Omega-3 to function normally and keep certain diseases at bay, yet the average person does not get enough of it from their diet. Numerous clinical studies have shown that Omega-3 supplements can be used to improve both mental and physical health. Omega-3 Premium Fish Oils is a dietary supplement that will serve this need. Omega-3 Fatty Acids – These are well-known fatty acids that provide the body with many health benefits; physical, mental, and emotional. Natural Fish Oil Concentrate – This substance has been proven to lower the levels of Triglyceride in the blood, while also preventing the walls of the arteries from hardening. EPA (Eicosapentaenoic acid) – EPA boosts cognitive function and cardiovascular performance but is ineffective in treating symptoms of Type-2 diabetes. DHA – DHA also boosts mental and heart health but has not been found to lower blood sugar levels in Type-2 diabetes patients. 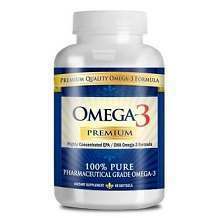 Omega-3 Premium Fish Oil has a recommended dosage of 2 soft gel capsules taken once a day. This dietary supplement can be taken with food or a glass of water. Omega-3 Premium Fish Oil was initially priced at $11.95 per bottle. However, that has now changed. Omega-3 Premium Fish Oil is now priced at $4.95 per bottle, meaning that customers now save $7 on every bottle purchased. One bottle of Omega-3 Premium Fish Oil contains 100 soft gel capsules. 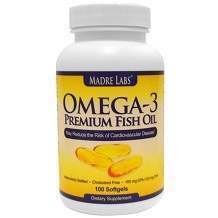 Madre Labs does not offer its customers a guarantee when buying Omega-3 Premium Fish Oil. There is no return policy or refund if a buyer is not satisfied with the product. As a dietary supplement, Omega-3 Premium Fish Oil contains the ingredients that can improve health and performance. It is made from essential fatty acids that are good for the body, but the product source does not provide any details as to the quantities used in manufacture. The amounts used could actually be too low to make a difference in the body, especially considering the super low price per bottle. It is cheaper than all the other Omega-3 products in the market, and does not offer its buyers any form of guarantee, which definitely raises a red flag.